NOAA Fisheries today designated critical habitat for Atlantic sturgeon--an important step to ensuring their recovery. The ESA requires that NOAA Fisheries designate critical habitat when a species is listed as threatened or endangered. Under the ESA, critical habitat is defined as specific areas within the geographical areas that are occupied by the species, that contain physical or biological features essential to the conservation of that species, and that may require special management considerations. The designation of critical habitat does not include any new restrictions or management measures for recreational or commercial fishing operations, nor does it create any preserves or refuges. Instead, when a federal agency funds, authorizes, or carries out activities that may affect critical habitat, it must work with NOAA Fisheries to avoid or minimize potential impacts to critical habitat. The activity of the federal agency may need to be modified to avoid destroying or adversely modifying the critical habitat. "We look forward to working with our federal partners to reduce potential impacts to Atlantic sturgeon critical habitat," said Samuel D. Rauch III, deputy assistant administrator for regulatory programs at NOAA Fisheries. "Our focus now will be on providing guidance to federal agencies to help them carry out their actions efficiently and effectively while minimizing impacts to habitat that is critical to these endangered and threatened populations of sturgeon." Atlantic sturgeon are anadromous and use coastal and estuarine waters throughout their lives, and travel to rivers to spawn or lay their eggs. Unlike some anadromous fish, sturgeon do not die after spawning and will return to spawn multiple times. They can grow up to 14 feet long, weigh up to 800 pounds, and live up to 60 years. Historically, Atlantic sturgeon inhabited approximately 38 rivers in the United States spanning from Maine to Florida. Scientists identified 35 of those as spawning rivers. Atlantic sturgeon can now be found in approximately 32 of these rivers, and spawn in at least 20 of them. 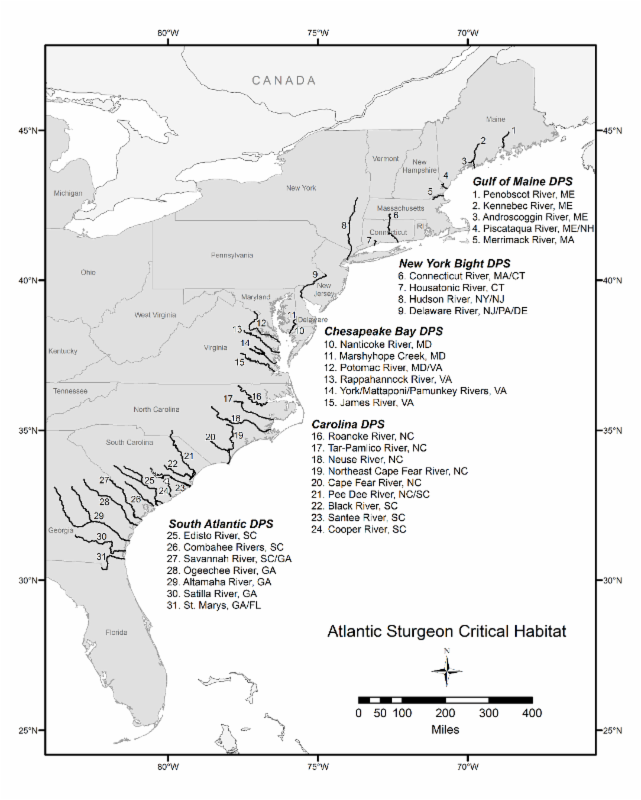 Critical habitat areas in coastal rivers were identified based on physical and biological features, such as soil type in the river bed, water temperature and salinity, and underwater vegetation, that are essential to the conservation of Atlantic sturgeon, particularly for spawning and development. Atlantic sturgeon were harvested heavily in the twentieth century, particularly for their eggs (or roe) used for caviar. Overfishing led to a decline in abundance of Atlantic sturgeon, and in 1998 the Atlantic States Marine Fisheries Commission issued a coast-wide moratorium on the harvest of Atlantic sturgeon, and NOAA Fisheries followed with a similar moratorium in federal waters. More information on the critical habitat designation is available in the Federal Registernotice and on our website. Read more about our Atlantic Sturgeon Recovery Program.